Following the 7-day pop-up shop and Fabric of Football exhibition (https://www.standard.co.uk/sport/football/fabric-of-football...), Classic Football Shirts are delighted to announce a new 11 day World Cup event taking place The BOX, Hackney, featuring live screenings (with bar) of the opening two rounds of Group Stage fixtures as the World Cup finally kicks off in Russia. The space also features a unique pop-up shop retailing thousands of vintage classics, and some truly unique and obscure current favourites, including designs such as the Cultural Leonesa ‘Tuxedo’, Loja CD’s ‘Prawn’ shirt, Palencia’s ‘Flesh’ kit with many more waiting to be discovered! 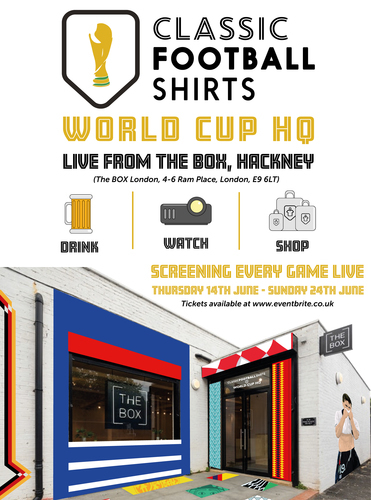 The event will launch on the opening day of the World Cup on Thursday June 14th and run until Sunday 24th June, with a limited capacity of 100 per game. Tickets are available for every game via Eventbrite for guaranteed entry (https://www.eventbrite.co.uk/d/united-kingdom--london/classi...). Tickets for some games are £5 with this amount refundable as a voucher in the store. The space will also feature artwork of iconic moments and players from previous tournaments and should be the perfect place to enjoy the game as the excitement and drama of Russia 2018 unfolds. This press release was distributed by ResponseSource Press Release Wire on behalf of Classic Football Shirts in the following categories: Men's Interest, Entertainment & Arts, Leisure & Hobbies, Sport, Media & Marketing, Retail & Fashion, for more information visit https://pressreleasewire.responsesource.com/about.